Lockheed Martin, the global security and aerospace company, today signed its first international Master Research Agreement with King Abdullah University of Science and Technology (KAUST). 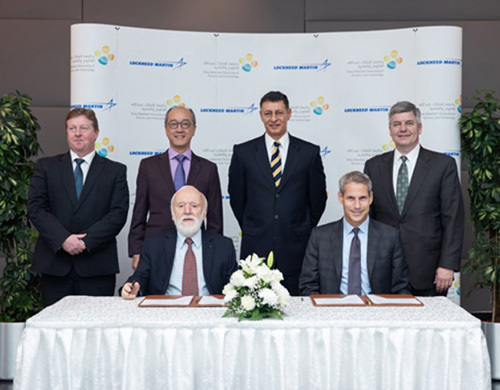 The two organizations have also announced their initial collaboration in the field of flexible electronics, which will include the integration of KAUST developed flexible solar cells on fixed-wing unmanned aerial vehicles (UAVs) to enhance their operational endurance and support applications across a variety of sectors. The agreement follows a Memorandum of Understanding (MoU) that was finalized by Lockheed Martin’s Chairman, President and Chief Executive Officer Marillyn Hewson on her visit to KAUST in November 2017, where she also serves on the Board of Trustees. Under the terms of the contract, Lockheed Martin and KAUST agreed to cooperate on various technology-focused projects that support Saudi Vision 2030. “Innovation in technology and engineering is a key driver of Saudi Arabia’s sustained long-term growth. Lockheed Martin is proud to help play a defining role in promoting the Kingdom's thriving R&D efforts as a committed partner to KAUST,” said Lockheed Martin Chief Technology Officer Keoki Jackson. “It is only through hands-on collaboration that we will be able to discover innovative solutions to conquer existing challenges, and we are looking forward to working with Saudi talent as we realize a safer and more secure future,” he added.